While it didn’t even exist a decade ago, the all-mountain freestyle category has been blowing up over the past several years, and the attempt to combine all-mountain performance with playfulness and trickability has produced some really fun skis. 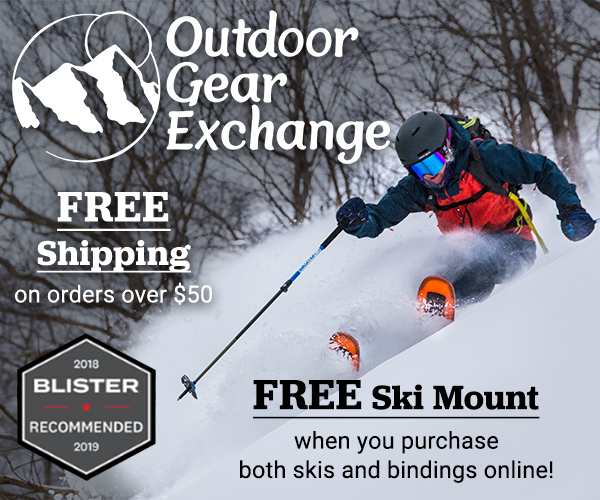 From fat park skis to very strong and stable chargers that you can also spin and flip, this category now offers a broad range of options for skiers that like to take a playful approach to the mountain. 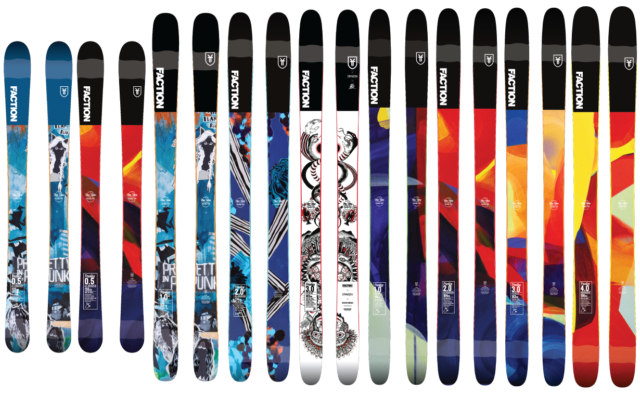 But for 18/19, Faction is updating the line with some new construction and shapes, and the Prodigy 3.0 gets the most major overhaul, with an all-new shape, core, and rocker profile. We’re pretty excited about all of the changes, so let’s take a look. There’s a lot going on in that description. First, the Prodigy 3.0 features a new Poplar/Ash core with Flax reinforcements, while the last version had a Poplar/Beech core without any Flax. Second, Faction mentions “the right mix of pop and dampness” — two characteristics where one often comes at the cost of the other. Finally, they say the new ski is “playful, solid, and versatile enough to do it all” — i.e., it seems like they’re going for the infamous 1-ski quiver category. So we’ll be keeping all of these claims in mind throughout our testing of the new Prodigy 3.0. We don’t normally say a whole lot about ski graphics, but the pair of Prodigy 3.0’s that we’re reviewing is worth noting (we actually gave it our “Best Graphics” award at SIA / OR). And after getting the skis in hand, we’re still just as stoked on these topsheets. The pair we’re reviewing is a special edition that’s part of a collaboration with Dragon Alliance, featuring art from Japanese artist, Kengo Kimura. But truth be told, the standard versions of the Prodigy skis look pretty awesome, too. They feature art from a mural made by street artist, SatOne, and we think the standard Prodigy lineup is one of the best-looking series for 18/19. Well done, Faction. One of the most important changes to the new Prodigy 3.0 is in its rocker profile. Despite having a good deal of tip and tail taper, the old Prodigy 3.0 had very shallow rocker lines compared to many all-mountain freestyle skis of this width. The new Prodigy 3.0 has significantly deeper tip and tail rocker lines, and more tip and tail splay (65 & 54 mm for the new vs. 49 & 40 mm for the old version). Despite now having a stated waist width that’s 2 mm narrower than the last version (104 mm vs. 106 mm), the new Prodigy 3.0’s rocker profile suggests that it should be much looser and surfier in soft snow. We’ll be curious to see if that is indeed true, and whether it comes at the cost of much firm snow performance. Overall, we really like the flex pattern of the Prodigy 3.0. It’s pretty strong throughout, but the tips and tails still feel like you’ll be able to flex into them. The tips and tails also feel like they have a lot of rebound when hand-flexed, which we’re curious about since we didn’t find the previous Prodigy 2.0 or 3.0 to be especially poppy. Overall, the new Prodigy 3.0 is a bit stiffer than the previous iteration. The front half of the new Prodigy 3.0 feels pretty similar to that of the Fischer Ranger 102 FR, but the Prodigy 3.0’s tips are actually very slightly stiffer. The back half of the Ranger 102 FR feels noticeably stiffer — the Prodigy 3.0’s flex pattern feels pretty round / nearly symmetrical. Compared to Faction’s other mid-fat all-mountain freestyle ski, the Candide 3.0, the Prodigy 3.0 feels stiffer and snappier (at least while hand-flexing it) in both the tips and tails. The new Prodigy 3.0 is slightly slimmed down, from 106 mm to 104 mm at the waist. The 183 cm 18/19, 183 cm Prodigy 3.0’s dimensions at the tip are 2 mm wider and the tails are 2 mm narrower than the 17/18, 182 cm Prodigy 3.0, making the new Prodigy 3.0 slightly less symmetrical in shape compared to the last version (8 mm tip / tail difference for the new version vs. 4 mm tip / tail difference in the previous version). The new Prodigy 3.0 also comes in new length options of 170, 177, 183, and 190 cm. The previous iteration was offered in a 172, 178, 182, and 186 cm. Our pair of the 17/18, 186 cm Prodigy 3.0 came in at 1942 & 1943 grams per ski, which is significantly lighter than the 18/19, 183 cm Prodigy 3.0 (2133 & 2134 grams). We’re pretty psyched about this bump up in weight, since we think it should help the new Prodigy 3.0 feel a bit more stable at speed, but we doubt the ski will feel all that heavy on snow due to its tapered shape and generous rocker profile. While Faction emphasizes the Prodigy series’ freestyle origins, the -8 cm mount point of the Prodigy 3.0 seems to suggest that more directional skiers might also get along well with it. Despite its more traditional mount (compared to other skis in this all-mountain freestyle class), the Prodigy 3.0 still has a nearly symmetrical flex pattern and rocker profile, so we’ll be playing with the mount point to see how comfortable the Prodigy 3.0 feels both at the recommended line, and with the bindings pushed forward. With the new Faction Prodigy 3.0, it looks like Faction has a made a strong contender in the competitive all-mountain freestyle class. Its weight, solid flex pattern, and increased tip and tail rocker all seem to suggest that it’ll be a strong but playful ski. We’ve now spent several days on the Prodigy 3.0, and Blister Members can check out our Flash Review below. As we spend more time on the ski, let us know any questions you’d like to see addressed in our full review. Blister members can now read our initial on-snow impressions in our Flash Review of the Prodigy 3.0, with our initial comparisons to the Faction Candide 3.0, ON3P Kartel 108, and Fischer Ranger 102 FR. Nice review. Could you please answer following question? I tried CT 2.0 in park – and really like swing weight, flex and rail performance. However on all mountain side it seems that I didn’t like its true twin shape in really soft snow, bumps and powder I felt like it was harder to ski than on skis with directional twin shape (I mean when tip is wider than heel). like heel constantly hooked on snow. I wonder how prodigy 3.0 with -2.5…-3 mount would compare to CT 2.0 or CT3.0 as 1 travel ski to learn stuff in park and ski all mountain. your flex indication shows that they are really stiff. With ct 2.0 butter become really easy. Also I’m 177 cm and 60 kg. Would it still be easy to butter these skis (prodigy 3.0) in 183?